Facebook founder Mark Zuckerberg is in Italy visiting the country following the earthquake. But he also took time out of his schedule to meet Pope Francis at the Vatican on Monday. 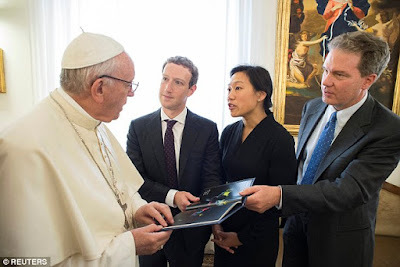 Zuckerberg and his wife, Dr. Priscilla Chan at The Vatican discussed one of the Facebook CEO's favorite topics: connecting the world. Mark Zuckerberg gave Pope a miniature model of Aquila as a souvenir. Aquila is company’s solar-powered plane project–which aims to beam down Internet via lasers from the skies. "We gave him a model of Aquila, our solar-powered aircraft that will beam internet connectivity to places that don't have it," Zuckerberg wrote on Facebook. The tech CEO is the latest in a line of technology leaders who have scored a private audience with the pope. 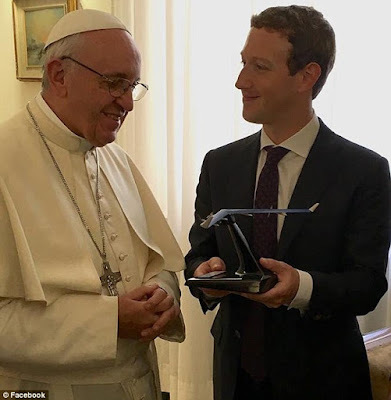 Earlier this year, Pope Francis had separate meetings with Apple CEO Tim Cook, Alphabet chairman Eric Schmidt and Instagram CEO Kevin Systrom, who helped the pontiff join the photo sharing service.